If I knew then what I know now. I can't tell you how many times I've thought that. Dennis Trittin has written a wonderful book for young people to impart his wisdom so that they can know what we all wish we had known at 18. What I Wish I Knew at 18: Life Lessons for the Road Ahead provides not only insight but practical applications and questions for the reader to ponder. This book would make a great gift for the teenager in your life. Mr. Trittin shares his "life success pointers" in areas such as character, relationships and communication, spiritual life, handling adversity, college academics, career selection, love and marriage, and managing finances. One of my favorite quotes from the book is "Remember that moral victories from doing your best can have just as much lasting value as an actual win." (p.44) This is the wisdom I want my children to glean from as they leave the nest and enter the next phase of their lives. 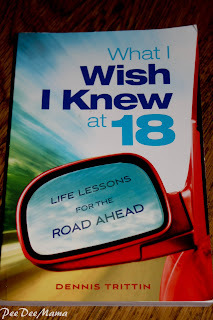 You can learn more about What I Wish I Knew at 18: Life Lessons for the Road Ahead and Dennis Trittin from his website, Facebook page, and blog. You can also follow him on Twitter and sign up for his newsletter. Not only did I get a copy of What I Wish I Knew at 18: Life Lessons for the Road Ahead, but I also get to offer a copy to one of my lucky readers.